On 15th April’2018 a spiritual discourse program was arranged by Divya Jyoti Jagrati Sansthan in Anoopgarh, Rajasthan. The emphasis of this program was, among others, initiating into Brahm Gyan and treading on the spiritual path. Sadhvi Ji spoke on the importance of a Guru in our life and said without attaining a Perfect Spiritual Master or Guru one cannot attain liberation which is the goal of human life. The soul traverses through various species and life forms to finally be in unison with the creator. Only when an individual is blessed with Brahm Gyan can one realize this truth of birth and death. Sadhvi Ji said that a Perfect Master is the one who has transcended the limitations of the human body to attain God. Perfect Master has seen God within his inner world and remains ever in touch with the Supreme Reality and He can enable every individual to perceive the practical vision of God. During the course of her speech Sadhvi Ji gave several examples- one was that of Swami Vivekananda, who visited a hundred spiritual masters before meeting Ramakrishna Parmahansa, the Perfect Master who imparted him with Brahm Gyan- the direct perception of divinity. In another example Sadhvi Ji mentioned that Guru is the medium that shows God and this is the reason why even the gods and goddesses when they came in human robe, reached out to receive the blessings from their Guru. It is said that after creating the universe, God could not find a better place to reside than the seat of the soul within a human body. Human mind always looks outside and searches for God in different places. God is hidden within and the key to this seat of soul is with the Perfect Master. Sadhvi ji spoke on the litmus test of a true Guru, for in today’s time there are many imposters in the garb of a guru. It is not correct for a person to go by one’s colour of clothes or impressed by someone’s eloquence or grandeur or the flocks of followers. When we meet a saint, we should seek for knowledge which can show us the path and light, to reach out to our creator. This is the Supreme Knowledge by knowing which everything else is known and nothing else needs to be sought after. This divine knowledge is achieved by no external means. Hence no verses or Holy Scriptures can help us to attain God, though they do provide the roadmap to a Guru. True form of dhyana cannot be done by focusing on any external object rather by a target which is immovable and is permanent. This target is soul. 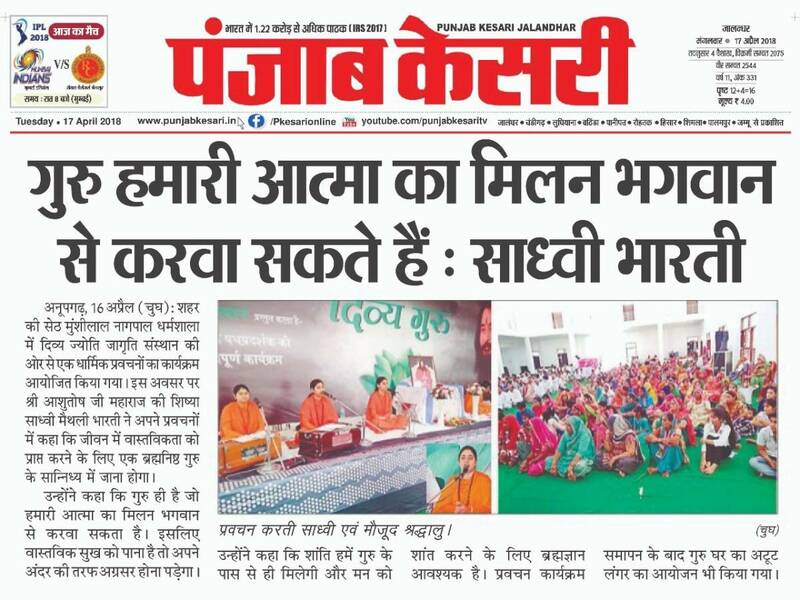 Sadhvi ji highlighted the importance of practice in the path of dhyana. By regular practice of dhyana, a soul progresses in this path. Outside the main congregation, there were some stalls where promotional materials and products were kept. Volunteers donated their time and energy in managing these counters. Devotees who attended this program felt elated and blessed as they understood the need for spiritual realization in life.